As a director of content marketing for a digital agency, I’ve noticed a pattern as we bring on new clients: Their brands aren’t as strong or as differentiated as they should be. In addition, most of them do traditional product-centric versus customer-centric communication. Their customers have changed, but they haven’t. Practitioners must have a deep understanding of what matters most to the target audience — their problems, challenges, and aspirations. Admittedly, this sounds a lot like content marketing 101 — creating customer personas, understanding the buyer’s journey and how their information needs to evolve along it, and proactively answering their most important questions. Yet, according to CMI’s latest research, many B2B marketers still aren’t doing these basics. There’s no question about it: We’re in the middle of a content arms race. As more B2B marketers adopt best practices, buyer expectations continue to rise. They demand greater insights and information tailored to their deepest needs, not generic one-size-fits-all platitudes. That means you need to bring your A game. 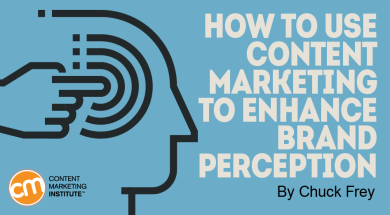 The common thread of the advice of these 14 content marketing leaders is quite clear: With the proper planning and execution, content marketing can definitely influence the brand perceptions of customers. That’s not to say it’s an easy task. Like any other aspect of marketing, brand enhancement requires you to make a long-term commitment to it — to go “all in,” as Joe Pulizzi has been telling us lately. Changing brand perception demands extraordinary consistency in all parts of your company’s go-to-market strategy — not only in the content you produce and distribute, but also in the ways in which you convey a unified set of values and experiences in all of your touchpoints with your target audience, including sales and product support.